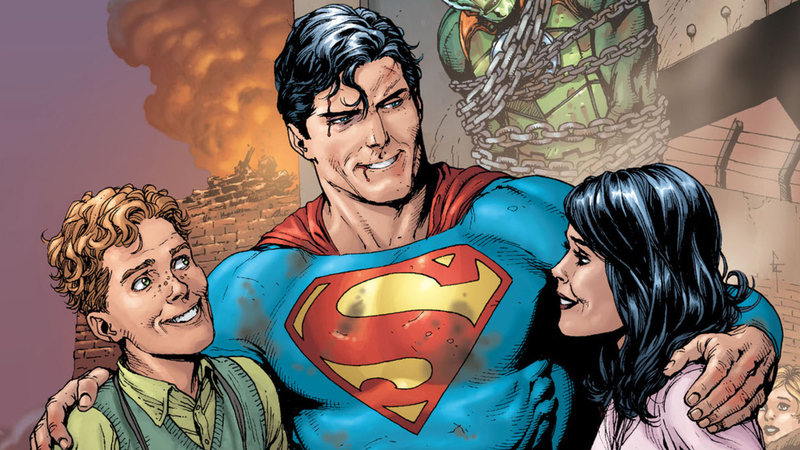 What's New on DC Universe: SUPERMAN: SECRET ORIGIN, 52, and FOREVER EVIL! It's officially February, and yes, this is indeed Superman's birthday month! Yup, the Man of Steel has adopted February 29th as his birthday. And even though there is no February 29th this year, we can still celebrate this joyous occasion with a ton of cool Superman-related comics which have just arrived here on DC Universe. We've got the modern retelling of Clark Kent's classic origin story in Geoff Johns and Gary Frank's Superman: Secret Origin limited series, along with Grant Morrison's New 52 era update in Action Comics. Plus, the first twelve issues of the critically acclaimed Rebirth era New Superman, featuring the Superman of China, along with the first volume of Superwoman! Other cool new comics are the seminal 2006-2007 weekly event series 52, in its entirety; along with 2 other event comics: Forever Evil, which focuses on DC's greatest super-villains and how they deal with a world where the heroes have vanished, and 1986's Legends, which announced the arrival of the Modern Age of DC heroes in the wake of Crisis on Infinite Earths. We also have the most recent reinvention of the Wildstorm universe in 2017's The Wild Storm. Want some solo hero action? For those of you still in the Aquaman frame of mind after his blockbuster film, the first sixteen issues of his most recent series, the Rebirth era Aquaman, are here for your reading pleasure. As well as 1990's original and still hilarious Lobo limited series, the first series devoted to DC's "Main Man". Elsewhere on DC Universe... February is also Black History Month, so there's no better time to celebrate one of DC Comics' first African-American Super-Heroes, who started out in the groovy '70s and now has a very successful television series of his own. We're talking of course about Jefferson Pierce, better known as Black Lightning. If you love this trailblazing hero, then you'll want to enter our "Black Lightning First Appearance" Sweepstakes, and get a chance to win some cool electric swag focusing on everyone's favorite teacher turned costumed adventurer. This sweepstakes starts today, February 5th, at 9AM PST, and ends next Tuesday, February 12th. We also have another exciting sweepstakes that all DC Universe subscribers are automatically entered in. It’s our “Batman 80th Celebration + Convention Sweepstakes”, in which one lucky fan will will a trip for 2 to an upcoming convention, including hotel accommodations, convention passes, attendance passes for DC Panels and talent signings, and some sweet, sweet Batman merch! Not a DC Universe subscriber? Just go to dcuniverse.com and join! Last but not least... Keep an eye out for an announcement in our Community about our next watch-along, focused on DC's Saturday morning cartoons. To help whet your appetite, be sure to participate in our latest poll -- "Pick Your Saturday Morning Joker"! What are you most excited about this week on DC Universe? Be sure to let us know in our Community!